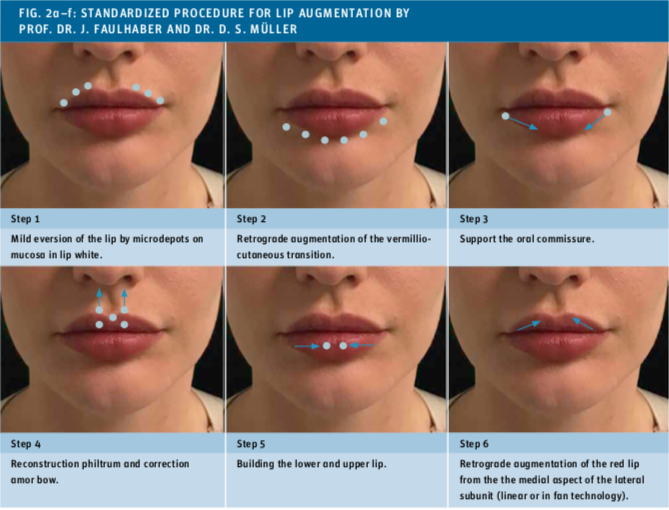 Lip augmentation plays a very important role in minimally invasive aesthetic therapy [1,2]. Although the most frequently described techniques are simple procedures, unsatisfactory results are regularly achieved. The lips have an unnatural appearance after the treatment. The reason for this is that the anatomical conditions are not taken into account [3,4]. In some cases, aesthetic improvement is not synonymous with pure volume enlargement, since an improvement in definition or proportion can be equally effective and natural. 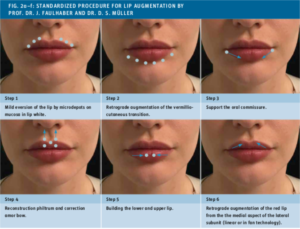 During lip augmentation, the dentist should concentrate on the overall aesthetic impression of the lips and face and not only on the pure administration of volume . Therefore, an anatomical-based, step-by-step approach should form the basis of the treatment, taking into account the individual aesthetic needs of the patient [6,7]. The patient analysis is therefore multifactorial and includes asymmetries, facial aging, the aesthetic subunits of the lips and, above all, the lip proportions. Another often underestimated criterion in lip analysis is the attractiveness of the patient’s smile. With the ZFill products from Zimmer MedizinSysteme, the dentist has access to the latest cross-linked hyaluronic acid products for perfect lip augmentation with a long shelf life. On the one hand, these hyaluronic acids initiate biological processes for tissue regeneration and, on the other hand, have a high moisture-binding capacity. Due to the easy modeling and the excellent tissue integration we decided to use the preparation ZFill contour² from Zimmer MedizinSysteme. A 30-year-old woman without previous illnesses presented herself in our practice for the aesthetic treatment of her lips. After a thorough anamnesis and asking about the patient’s expectations and wishes, the anatomical conditions were first analysed. The patient’s upper and lower lips were very narrow and low in volume (disproportion of the upper lip volume in relation to the lower lip). In addition, a flattening of the cupid arch was visible. 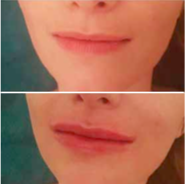 The aim of the augmentation was on the one hand to improve the lip volume with a natural appearance without overcorrection and on the other hand to improve the lip projection. In particular, the natural ratio of upper to lower lip should remain 1:1.6 (Fig. 1). Fig. 1: The natural ratio of upper to lower lip should remain 1:1.6. 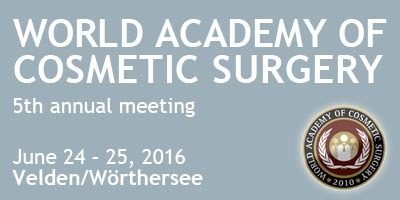 In the future more and more patients will turn to aesthetic dermatology. The overall average age of patients will decrease. We also observe that the trend is towards low-grade invasive procedures. Here, ZFill products are excellent volume and lifting products that can replace lost volumes with an excellent lifting effect and aesthetically tighten decreasing contours in a very appealing way. In the lip area, in addition to ZFill contour², ZFill deep² can also be used very safely and with an excellent volume effect even with pronounced volume losses. Sattler G, Sommer B (2010) Bildatlas der ästhetischen Augmentationsverfahren mit Fillern. KVM Dr. Kloster Verlags-GmbH, Marburg, 1. Auflage. Caruthers A, Caruthers J (2007) Nonanimal based hyaluronic acis fillers: Scientific and technical considerations. Plast. Reconstr Surg.120: 33S-40S. Baumann L (2004) Replacing dermal constituents lost through aging with dermal fillers. Semin Cutan Med Surg.23: 160-166. Lee SH. Et al. (2015) Topographic anatomy of the superior labial artery for dermal filler injection. Plast Reconstr Surg.135: 445-450. Rumyantsev E. et al. (2012) What`s new in lip injection. Plast Aesthet Med.80-90. Surek CC et al. (2016) „No-touch“ technique for lip enhancement. Plast Reconstr Surg.138: 603e. Raphael et al. (2013) Analysis and classification of the upper lip aesthetic unit. Plast Reconstr Surg.132:543. Runner PM, Leung DYM, Guttman-Yassky E (2018) Immunologic, microbial, and epithelial interactions in atopic dermatitis. Ann Allergy Asthma Immunol. 120(1): 34–41. 9. Rerknimitr P, Otsuka A, Nakashima C, Kabashima K (2017) The etio- pathogenesis of atopic dermatitis: barrier disruption, immunological derangement, and pruritus. Inflamm Regen. 37: 14. 10. Ahn C, Huang W (2017) Clinical Presentation of Atopic Dermatitis. Adv Exp Med Biol. 1027: 39–46.